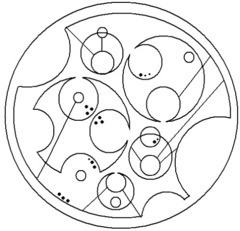 Circular Gallifreyan is a standardized version of the written Gallifreyan language as seen in Doctor Who. It was standardized by a fan, so it is not officially sanctioned, but it looks terribly cool. 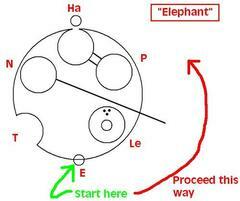 You can read a guide to Gallifreyan online or just read The Honey Badger's guide below. 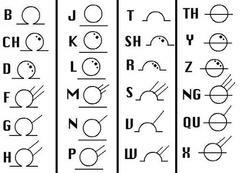 Doctor Who and Gallifreyan are © BBC, and this alphabet is © Loren Sherman. If you're reading this guide, that's probably because you found the original guide a bit too confusing. If you haven't read the original guide, I recommend you at least give it a shot - after all, that comes direct from the source and I'm just interpreting the rules. Consonants take one of four forms and are modified by one of five different designs. In the chart to the left, you can see the four basic forms along the left side and the five modifications along the top. The dot modifications are included within the circle of the letter while the line modifications extend outward from the circle of the letter. 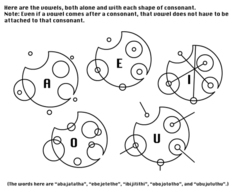 To get a better idea for how each letter looks, to the right is a complete set of Gallifreyan consonants. Consonant designs, that is, the dots or lines that differentiate the consonants, do not rely on placement or size to distinguish. So long as the appropriate number of lines or dots are placed on that consonant, then it is correct. More on this later. Vowels are a bit trickier. Vowels are either attached to the preceding consonant or they float on their own - either way they are smaller circles than the consonants and have slightly different rules. In the diagram to the left, you can see how each vowel looks both attached and unattached to a consonant. 'A' is written as a small circle just outside of the main line of the word. 'E' is a small circle either centered on the line of the word or centered within any full-circle consonant. 'I' is a small circle with a line extending towards the inside of the word, either centered on the line of the word or centered within any full-circle consonant. 'O' is a small circle that rests inside the line of the word when it stands on its own, and when attached to a consonant it rests bisected on the inside edge of the letter. 'U' is a small circle with a line extending towards the outside of the word, either centered on the line of the word or centered within any full-circle consonant. A vowel does not have to be attached, and can stand on its own at the writer's discretion. As a general rule, however, a vowel should stand on its own if you want to elongate a short word (for example, 'T H E' might be put instead of 'T He'). In cases where a word starts with a vowel ('E Le P Ha N T' for example) or you have two vowels in a row ('Re A L' for example), a vowel will need to stand on its own because it has no consonant to attach to. 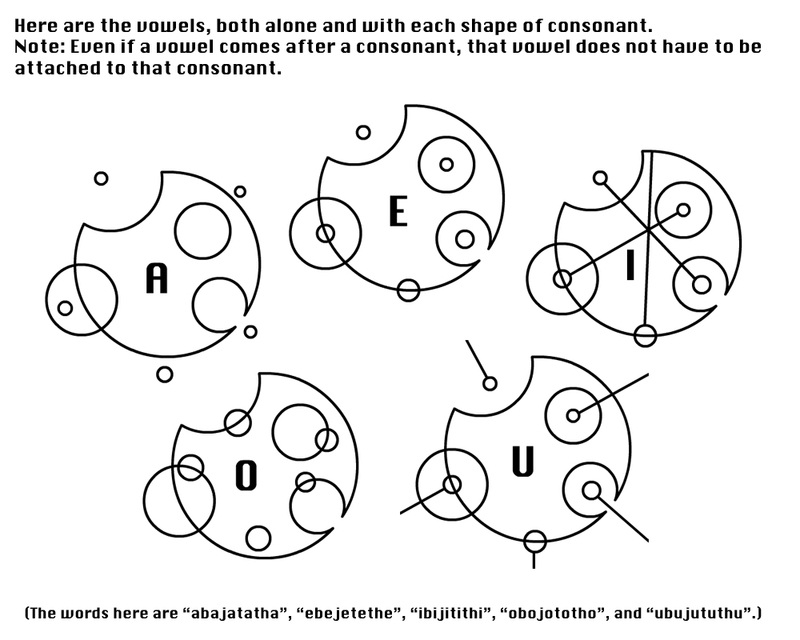 Words in Gallifreyan are based around circles. A word begins at the bottom of the circle (that is, the part of the circle closest to the bottom of the image/paper) and proceed anticlockwise around the word. An example can be seen to the right. Notice both attached and unattached vowels in action in this word. You also have two letters, 'P' and 'Ha' which are connected by lines. Since both 'P' and 'H' have two lines, we can draw those lines connecting the two letters. This does not have to be done, so long as both letters have two lines, they are written correctly. 'N', you can see, has a single line which is extending beyond the circle of the word. So long as lines do not intersect with letters that should not have any additional lines, they can extend as far as the writer wishes. Sentences are essentially just words made up of words. Just like a word, they are based in a circle and you read them starting from the bottom and then proceeding around anticlockwise. Punctuation can be added along the edge of the sentence circle. Sentences are contained within two circles, the inner of which you place the punctuation around, and the outer which is simply a containing circle. Or as a coherent sentence: "Oh my God hi reddit!" The three dots in the outer circle are an exclamation mark. This and the rest of the punctuation marks can be seen in the table below. Sadly, there does not seem to be a comma available at this time.